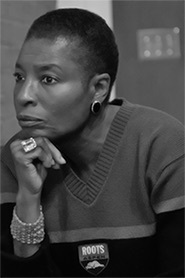 "The Family: Our Beloved Crisis"
Thursday, March 21, 4:30 p.m.
Hortense Spillers is a Gertrude Conaway Vanderbilt Chair in English at Vanderbilt University; she lectures widely both at home and abroad, most recently at the University of British Columbia where she spent the fall semester of the current academic year as an international visiting fellow at the Peter Wall Institute of Advanced Study and the Institute of Race, Gender, Sexuality, and Social Justice; Hortense Spillers is the recipient of a number of prizes and awards, most recently the Jay Hubbell lifetime achievement award for contributions to the study of American Literature, an honor conferred by the American Literature Association and an Alumni achievement award from Brandeis University where she received the doctorate in 1974; her essays have been collected in Black, White, and in Color: Essays on American Literature and Culture; Chicago, 2003. Currently at work on two large projects—the idea of Black culture and the status of women in the eighteenth century context of revolution and enslavement, she is addressing us today on a single aspect of the topic, the career of the family. The venue is wheelchair accessible and equipped with assistive listening technology. If you need additional accommodations to participate in this event, please contact us as soon as possible.